What a thrill it is to photograph the emotion that takes place during a wedding ceremony! 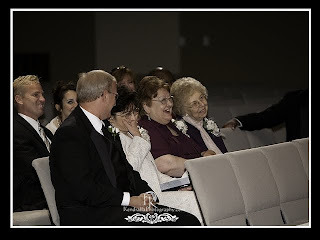 I never grow tired of photographing or watching grandma or papap wipe the tears from their eyes as they remember when their grandchild was as little as the ring bearer and once sat in their laps many years ago. Nor do I tire of seeing the bride all dressed in her beautiful dress walk over to her great grandma or great grandfather and give them a kiss and hug that brings the crowd to tears. As I watch the little girls dance during the reception, I remember the carefree times that I have when I dance with my granddaughter. We dance to the tune of Hanna Montana and I attempt to imitate my granddaughter’s special moves to fun songs that only a grandfather dancing with his little granddaughter can understand or appreciate. Photographing the little girls with their hair flowing is both a challenge and joy. My goal is always to capture the moment when the girls are dancing by themselves without a care in the world. Then when their mom or dad walks on the floor to dance with them to capture the look on their face as they dance with their little girl is always a fun filled time. I doubt that I will ever forget two beautiful young girls with long flowing hair that danced and danced without a care in the world. They would flip their hair imitating some dancer they might have seen and swing each other mimicking dance partners they watched one day maybe on the television or in the movies. Every wedding brings a special memory and challenge. For example, the time when the minister told me that once the ceremony began, we (photographers) could not move. Rather than complainr, I made a last minute call to a friend (photographer) and added a third photographer to capture the ceremony from all angles. We were able to capture the ceremony from many different angles creating special images for the heirloom album. As I photograph the couple dance for the first time as husband and wife, I remember back over thirty years ago when I had the first dance with my young bride. Oh how young we were and nothing else mattered than us dancing together. Soon after the first dance the father of the bride dances with his daughter. Watching this dance sends my mind to the day when I danced with my daughter at her wedding. I never wanted the dance to end and give her back to her husband. We danced to butterfly kisses, which now stands the test of time as a very special song in my life. After this dance, I remember it like it was yesterday, when I danced with my other daughter, then later cried watching and listening to my granddaughter sing L.O.V.E to her aunt. Every wedding brings back special memories to me and no doubt many others that attend a wedding.